The City of Newark, Department of Water & Sewer Utilities will be performing maintenance work on the Belleville Surge Tank beginning June 23, 2016. 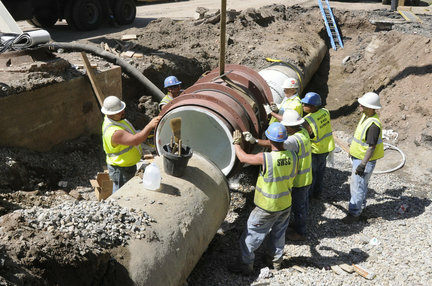 This tank provides water to the Newark Wanaque distribution system, which includes Newark’s East Ward, part of the North Ward, the Airport, the Seaport and the City of Elizabeth. THE WATER SUPPLY WILL NOT BE INTERRUPTED, however we expect minor water quality and pressure fluctuations from June 23 to July 8, 2016. During this process, several transmission system valves will be operated resulting in flow and pressure changes. This may also result in a discoloration of the water. If you experience any loss of pressure or water quality change, please contact our 24 hour Customer Service at 973-733-3654 or 973-733-8411.